10% Early booking discount available during the low season (3rd November - 28th December 2018 and 1st January - 31st March 2019) for bookings made 60 days prior to arrival. Please note that the prices listed do not reflect this discount - Please ask a member of the Premier Villas team to quote for your holiday. A selection of 'houses' surround the Martinhal village, close to the main resort facilities. One, two and three bedroom options are available in 4 different categories: Garden houses, Bay houses, Pinewood houses and Ocean houses. Please note minimum stays apply during different seasons, for further details please see 'Notes for this villa' under the calendar. The Pinewoods Houses are arranged along the edge of a pine forest, positioned in their own separate close. These linked villas enjoy a select location but remain within easy access of the main resort facilities. Contemporary in appearance, the use of clean forms and lines underline a stylish simplicity that is also adopted inside. Interior decor is sophisticated yet functional. Each house has its own small, private swimming pool that enhances a garden planted with wild, indigenous flora. Pinewoods Houses will appeal to families who appreciate a degree of seclusion but still like to be near the resort's leisure and entertainment attractions. There are 10 Pinewoods Houses available, with 6 two-bedroom Grand Deluxe and 4 three-bedroom Master Deluxe options. Facilities include: Voya amenities, 32" satellite television with multi-channel selection and video on demand, pay TV, wireless internet access, a MP3 docking station and telephone. Modern conveniences include designer kitchen, washing machine with integrated dryer, ironing board and iron, laundry rack, fridge, microwaves, stove, freezer, coffee machine and kitchen utilities. Village Houses benefit from a daily maid service. For further information about Martinhal Beach Resort and for alternative accommodation options, please visit our Martinhal Beach Resort Homepage. Minimum 2 night stay in all seasons except July - September when a 7 night minimum stay is applied. Cots are available upon request and are subject to availability. The first cot is free of charge, extra cots will be charged at 25 euros per night. Extra bed hire is unfortunately not allowed in the Village houses. Half board is also available for a supplement of 56 euro per person per day. Half board includes buffet breakfast, and lunch OR dinner (3 course menu, drinks not included). For children aged 3- 12 years, Half Board price will be 50% less. Barriers for beds & stairs, toilet seat adapter, potty seat, baby bottle sterilizer & heater. Please note that these items should be booked in advance and are subject to availability. All prices are for the villa only. Villas are booked from 3.00pm on your arrival day to 10:00am on your departure day. Please note that availability shown is subject to confirmation - please call our reservations team. 2 nights for all seasons, excluding high season (30th June to 31st August) which is 7 nights. 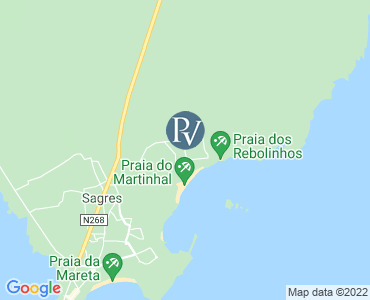 Sagres is the most south-westerly resort in the Algarve and in Roman times was part of an area called the Promontorium Sacrum (from whence the name, Sagres, derives). At this time it was believed to be the most westerly part of the world and it was thought that the setting sun off the point made the waters of the ocean boil. It is still relatively untouched by tourism and is an attractive town of mainly low rise houses, lining the quiet streets. Because of its location people often expect a wind-swept barren landscape, but Sagres is a truly tranquil town with beautiful beaches, a picturesque harbour at Baleeira, a very pretty square, Praça da República, and stunning views. It is very popular in summer with visitors, but all year round with fishermen and surfers because of the western Atlantic waters creating such good waves for surfing. The Algarve is one of the most popular tourist destinations in the world. Every year tourists in their thousands flock to the south of Portugal to soak up the sun and relax in this European paradise. The Algarve is full of history and heritage. Still standing today are buildings and walls dating back to the Roman times. You are never far from a museum or guided tour to allow you gain a more in-depth insight into the evolution of this beautiful region. The Algarve has the best all-year round climate in the whole of Europe, and can boast more sunshine hours than California! You can often see temperatures hit the mid 30's. With over 100 miles of dramatic cliff faces and extensive golden beaches, the Algarve offers one of the most dramatic coastlines in the world. There is something for everyone, whether you're after a relaxing day at an intimate cove, or water sports and tourist attractions on busy golden beaches. The Algarve is full of holiday resorts and hotels to make your stay as good as possible. Whether you are after a busy beach-front resort, or the more peaceful surroundings of a quiet private villa, you will be able to find the resort for you. Eating out in the Algarve holds a prominent position in Portuguese life and is the only way to truly discover the extent of the region's culinary range. Food in the Algarve can be seen to reflect the heritage of this fantastic Region, always full of flavour and richly prepared, and with roots dating back to a world long since gone.